2 pin posts / 2 green soft rubber clutches. 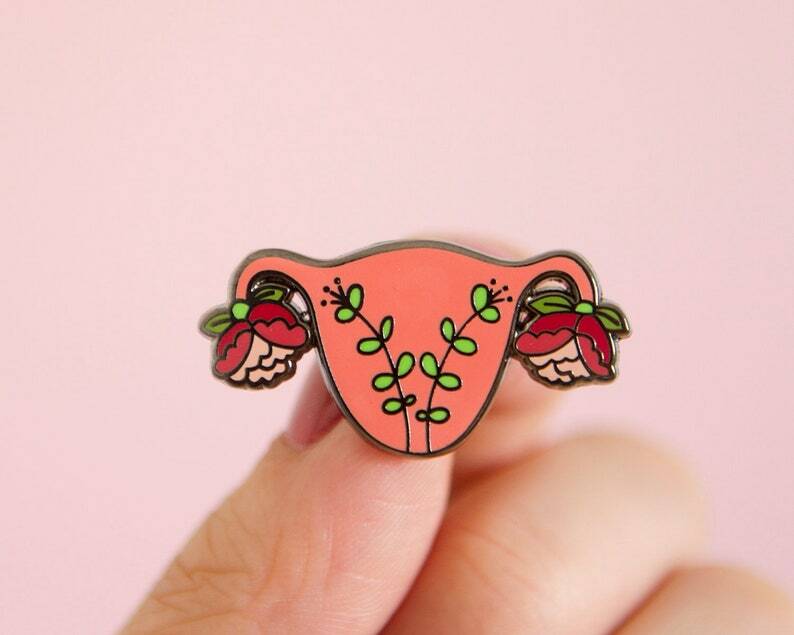 Blooming Uterus sticker (regular price $3.50). For an extra $2, add the matching sticker- a glossy coated vinyl sticker measuring 2 x 3.5 inches. 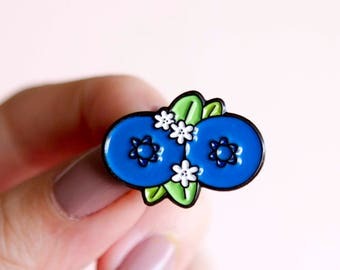 Absolutely gorgeous pin! Very happy with my purchase. LittleWomanGoods is unable to offer refunds or exchanges; please keep this in mind when purchasing! If your address is undeliverable and the order is returned to sender (me), a partial refund minus shipping will be offered. All items will ship via USPS. Stickers and patches will ship via USPS First Class Letter, and can be expected within 1 week but may occasionally take longer. Please note that the delivery date is only an estimate. Mail will not be considered lost until 30 business days have past. Standard shipping does not include tracking, but tracking can be purchased for an additional $2. If you would like tracking, please select the shipping upgrade when you check out. Orders that are returned to sender may be reshipped only if an alternative address is provided and re-shipment fee paid. Pins will ship via USPS First Class Package, and can be expected within 3-5 days but may occasionally take longer. Please note that the delivery date is only an estimate and that Little Woman Goods does not guarantee delivery dates. Mail will not be considered lost until 30 business days have past. Orders that are returned to sender may be reshipped only if an alternative address is provided and re-shipment fee paid. A tracking number will be sent to you with your shipping notification. All International orders will ship either with USPS First Class Letter International or USPS First Class Mail International. Please allow at least 7-21 days for international orders to be delivered. Please note that the delivery date is only an estimate and that Little Woman Goods does not guarantee delivery dates. International mail will not be considered lost until 6 weeks have past. Please note that buyers are responsible for any customs fees issued by their country. The amount of time your package spends in customs and the customs fees charged are entirely out of my control and determined by the destination country. Your order will ship from Los Angeles, California. If your order is returned to sender due to an error that is not ours (for example: shipping address provided is inaccurate, order was not picked up at post office, package was refused, etc.) you may elect to either have your order reshipped if an alternative address is provided and re-shipment fee paid OR you may elect for a partial refund of the item minus the shipping costs and a 20% restocking fee. Please message me BEFORE placing your order if you need your order by a certain day to confirm that it is possible. Instructions included in the "Note to Buyer" will not be seen until your order is already being shipped and there is no guarantee that I can accommodate them. Please provide an address that can be confirmed by USPS. LittleWomanGoods will not ship to an address which cannot be confirmed by USPS. All stickers are printed on a glossy coated vinyl and are waterproof, scratch resistant, and dishwasher safe. Please read all item descriptions thoroughly before purchasing! Measurements for all items are listed in inches. For wholesale pricing and bulk discounts, please contact me with details about the designs and quantities you're interested in. LittleWomanGoods products may not be resold on Etsy.com or rebranded. Stickers will ship via USPS First Class Letter, and can be expected within 1 week but may occasionally take longer. Standard shipping does not include tracking, but tracking can be purchased for an additional $2. If you would like tracking, please select the shipping upgrade when you check out. 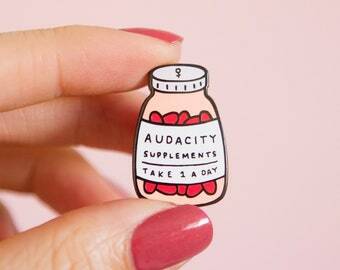 Pins will ship via USPS First Class Package, and can be expected within 3-5 days but may occasionally take longer. Please note that the delivery date is only an estimate. Mail will not be considered lost until 30 business days have past. Orders that are returned to sender may be reshipped only if an alternative address is provided and re-shipment fee paid. All International orders will ship either with USPS First Class Letter International or USPS First Class Mail International. Please allow at least 7-21 days for international orders to be delivered. Please note that buyers are responsible for any customs fees issued by their country. The amount of time your package spends in customs and the customs fees charged are entirely out of my control and determined by the destination country. For wholesale pricing, please contact me with details about the designs and quantities you're interested in.